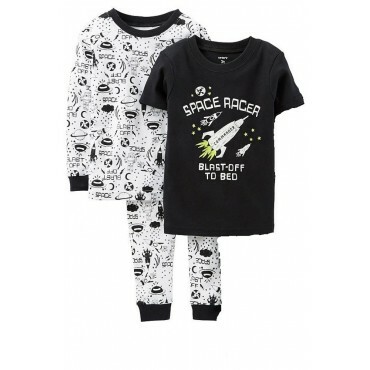 Light up his night with these glow-in-the dark space PJs! Black and White 100% Cotton Pyjamas, 3 pieces perfect for change of season wear. These Carter’s 4 piece pjs are absolutely adorable. One set of these pajamas features allover Baseball print on the top and bottoms and the other set are striped. All Boys Love Pirates. 100% Cotton Red White and Blue Pjs with allover pirate print on pants and pirate graphic on top. He’ll love dressing for bed in these Polar Bear pyjamas! The White Long Sleeve T-shirt features a Polar Bear Motif, and the polar bear patterned pants have an elastic waistband. Both pieces are made of the softest jersey cotton. They will love dressing for bed in these Petit Lem pyjamas! The Grey Long Sleeve Top features a cream ribbed neckline and a grey, maroon and white snowflake pattern, and the matching pants have an elastic waistband. Both pieces are made of the softest jersey cotton. He’ll love dressing for bed in these Polar Bear pyjamas! 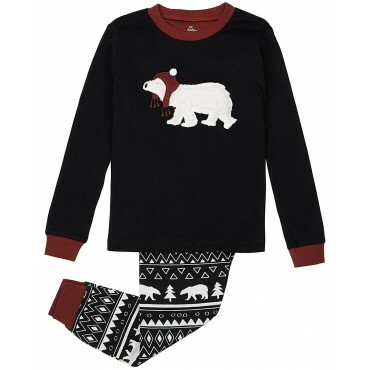 The Black Long Sleeve T-shirt features a red ribbed neckline and a Polar Bear Motif, and the patterned pants have an elastic waistband. Both pieces are made of the softest jersey cotton. Featuring Skip Hop’s signature Zoo characters, the kids pyjamas come to life with fun appliqués and embroidered details. With a scratch-free, double lined top, ZOOJAMAS™ are made of soft, 100 percent cotton for a good night’s sleep. These Carter’s 4 piece pjs are absolutely adorable. One set of these pajamas features allover Dinosaur print on the top and bottoms and the other set are striped with a dinosaur motif on the top. Kick off a great night's sleep in these blue cotton football print pyjama set! He’ll love dressing for bed in these Elf pyjamas! The White Long Sleeve T-shirt features a red ribbed neckline and an Elf Motif, and the striped pants have an elastic waistband. Both pieces are made of the softest jersey cotton. He’ll love dressing for bed in these Dragon pyjamas! The Long Sleeve T-shirt features a ribbed neckline, and the pants have an elastic waistband. Both pieces are made of the softest jersey cotton in blue , with an allover Dragon print.